When we first started dreaming about building a new house, one of my priorities was a large, walk-in pantry. I enjoy cooking most meals--and snacks!--from scratch. This has made living with our son's dairy allergy much easier, and now I appreciate my larger pantry even more. Our most popular post, and most often pinned image, is a photo of our old pantry. 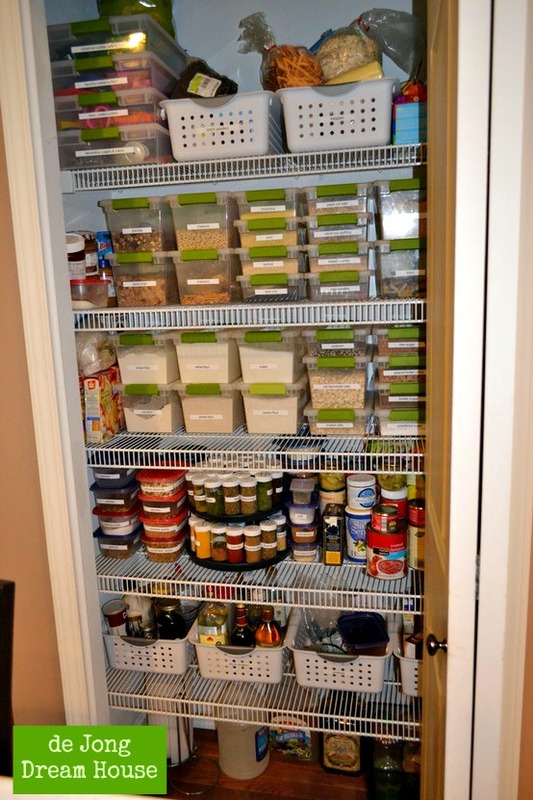 From what I can tell from the comments and questions I've received, this pantry is popular because it's doable. It's a standard size wire shelf pantry common in many homes. I wrote about this pantry here and here. We've been in the new house for ten months. I've followed the same organizational idea with the new pantry, but it hasn't been totally "done" because we ran out of money at the end of our build and decided to hold off on putting the custom shelving inside. I've been playing around with some repurposed furniture for the time being, and just recently got to a point where I feel everything is where it needs to be! So, won't you come in? The first thing you'll notice is the door. 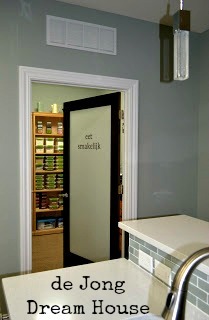 We wanted something different than the standard "pantry" with etched glass. 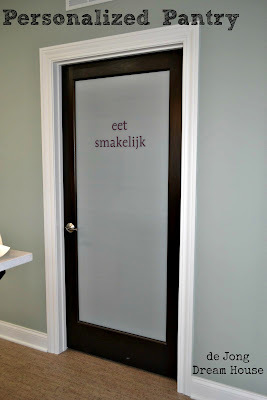 We had a frosted door installed, and ordered custom vinyl for the "eet smakelijk," which means "eat tastefully" in Dutch. Holland's version of bon appetit. You can read more about the door here. Also, you can't tell from the photo, but there is no light switch for the pantry. The light automatically turns on when the door is open, and turns off when the door is closed. Above the door, we have a vent for ventilation. With larger room, especially one with a freezer, it's good to let air circulate. I also keep the door open when I'm cooking to let fresh air in. 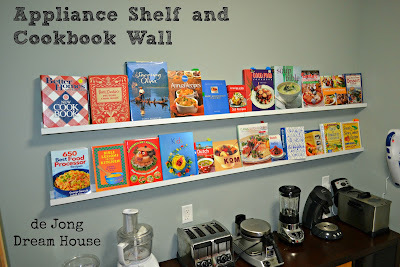 You can read more about why to vent a pantry here. The first thing you'll see to the left is the freezer. We have a stand up freezer for the meat we buy in bulk, as well as extra veggies, spices, and other staples. Now that I make dairy-free bread for our son, we keep a couple loaves in there as well. 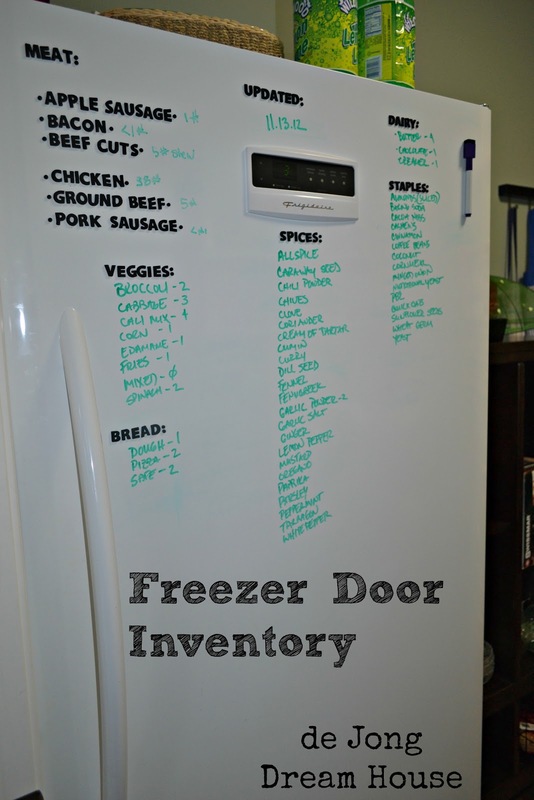 We chose a flat front freezer, rather than textured one, so I can use it as a dry erase board for inventory. I used foam letters (oh, how I long for a Silhouette!) to label the items that I always want to have on hand, and simply write the names of things that fluctuate. 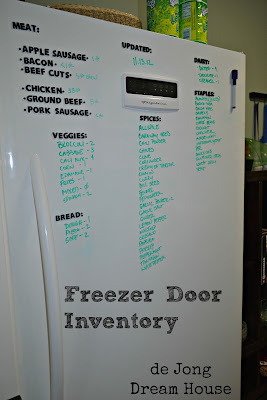 I keep a different colored dry erase marker on the frig to make updates as I take items out. Inside, I use Target's weave baskets to organize everything. 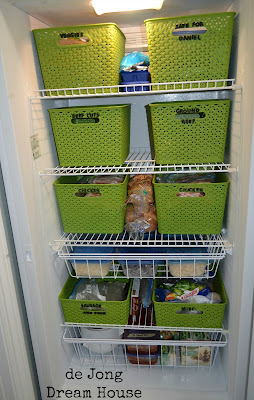 I was using white Sterilite baskets before, but these hold a lot more and make better use of space. Fun fact: 40 pounds of chicken can be contained in two baskets. Again, I used foam letters to organized. Helpful hint: the letters stick much better to baskets that are at room temperature than frozen! Under the chicken baskets, we have a drawer that I use to store chopped fruit and veggies. In this case, cabbage that I got at a great deal. Behind the cabbage, we have some frozen bananas. Moving on past the freezer, we have this little bookshelf, that I bought on clearance from a local furniture store. 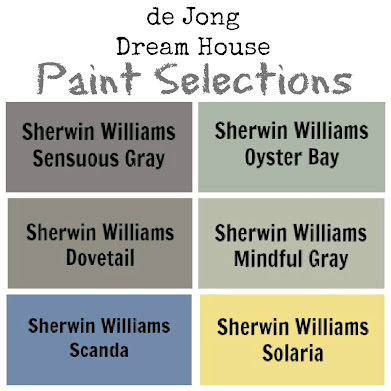 It was designed be LeBron James for a bedroom collection, just before he ditched Cleveland. Thus, we got a great deal on this and the two pieces on the other wall. I use it to hold serving dishes, vases and other infrequently used items. The bottom shelf has wire baskets that are perfect for my potatoes and onions. We put up two Tjusig hooks from Ikea to hold my aprons (on top) and D's aprons and things (on bottom). In the corner, I'm repurposing some shelves that were in our old house when we moved in. For now they house all the cooking magazines I need to sort through. The grey baskets on top hold bread bags (for my homemade bread) and toilet paper rolls (for crafts). The green basket holds essential oils. The first thing you see when you open the door is my wall of staples.Those two bookshelves are about the same size as my old pantry, so the storage containers will look familiar to those who are familiar with my old pantry. On top of the shelves, we have some pretty ceramic containers, and the mostly empty bottles of alcohol for when my mom comes to visit. On the top shelves, we have four of the same weave baskets that I use in the freezer. Niels and I share two, and Marissa has two. These are for snacks that are not safe for D. In addition to being hard to reach, I find that because they are hidden from view, I am more likely to leave them to Niels! Underneath the snack baskets on the left shelf are the containers for seeds, nuts, and other snacks. As you can see, I'm started to convert to glass containers. I like Versaglass by Ziploc. The next row holds cooking powders and grains. In the baskets I have homemade mixes for Italian dressing, ranch dressing, etc. The next row holds baskets for boxed items and cooking oils and vinegars. ...new items that I haven't decided whether or not they need a permanent place. ...a dedicated space for random lost or missing parts. I put it on a low shelf in the pantry so it's easy for anyone to find. I imagine this will fill up soon! Moving over to the left shelf, under Marissa's snacks we have my flours and sugars. And the pastas and rice. And safe items for our son. They are on a lower shelf so he can select his own snacks. Then the breakfast items. The boys eat Raisin Bran Crunch, one of the last processed foods I still buy. Usually, I have a few extra boxes to the left, but I haven't done my shopping for the week yet. On the bottom shelf, I have a few odds and ends, like popsicle molds, a train gingerbread house I'll be breaking out in a few weeks, Christmas cookie cutters, candles, pedialyte for when our son is sick, and drink mixes. In the corner, I hung up a cute little tulip quilt made by a friend of ours. One priority for the walk-in pantry was an appliance shelf. I wanted my kitchen counters clear, and the ability to easily grab an appliance when I need it without digging or bending. We put outlets along the wall so we can charge appliances, or even us them in the pantry. Eventually, I will have a built in shelf, but for now, I'm really happy with my LeBron furniture. 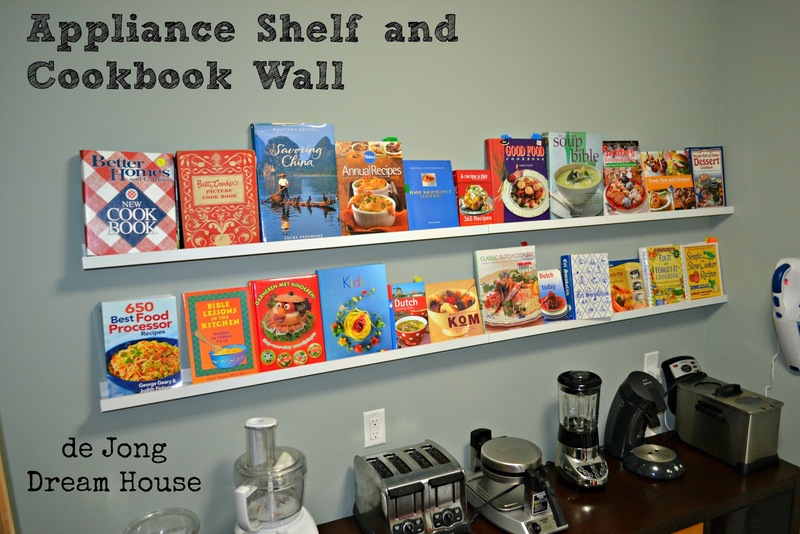 I took advantage of the long wall on the left to display my cookbooks. I used four Ribba photo shelves from Ikea. I wrote about the process here. Here's a better picture of the two pieces while I was still organizing. You can see the basketball theme in the design. The only change I made was to swap out the big basketball knobs with more subtle silver knobs. In the first shelf, I have a couple smaller, infrequently used appliances, egg cartons, spice grinder, extra parts for my new immersion blender, and football-theme serving dishes. Behind the "locker door," I have a few empty containers and my cleaning buckets. I really love the drawers in dresser. I used the top drawer for canned and glass food stuffs. The second drawer is storage container overflow. The fun part of finally get fully unpacked is that I'm discovering where I have duplicates...and triplicates. The bottom drawer is currently home to a few extra bamboo organizers I have left, as well as extra spray bottles for my homemade cleaners. In the locker, I have another serving tray and my spare jars. The pantry is also a great place for our dustbuster. And because I'm short and the walls are tall, I have my little stepstool in the 3" of extra space between the dresser and the wall. Niels took this panorama when he was playing with his new iPhone. One thing I've learned from this process is that it's not a job to be rushed. I'm glad that we didn't put shelves in right away. I have a better idea of how I use pantry now, so when we do put shelving in, it will really be custom to our needs. 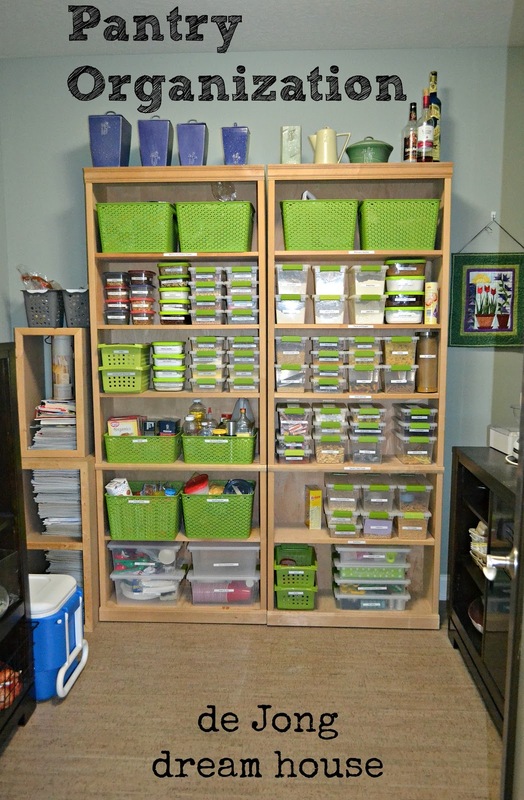 Another reason it takes time is because organizing supplies can be expensive. Re-using jars is a cheaper way to go, but I like the square containers that are better for stacking. 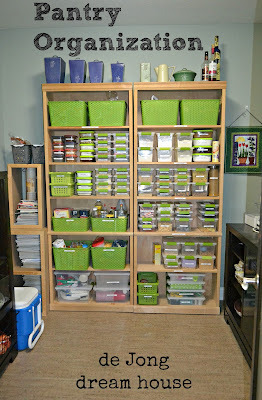 I started organizing this pantry almost six years and three homes ago when I started buying the matching containers. (I didn't match before). I didn't go out and buy thirty containers at a time. I think I started with four. I wanted to make sure that they fit with my shelving. They did, and I liked how easily I could tell when I needed to replenish an item. From then, as I ran out of a staple item, I would buy a new container at the same time I bought a new bag of say, flour. Thanks for peeking in my pantry. 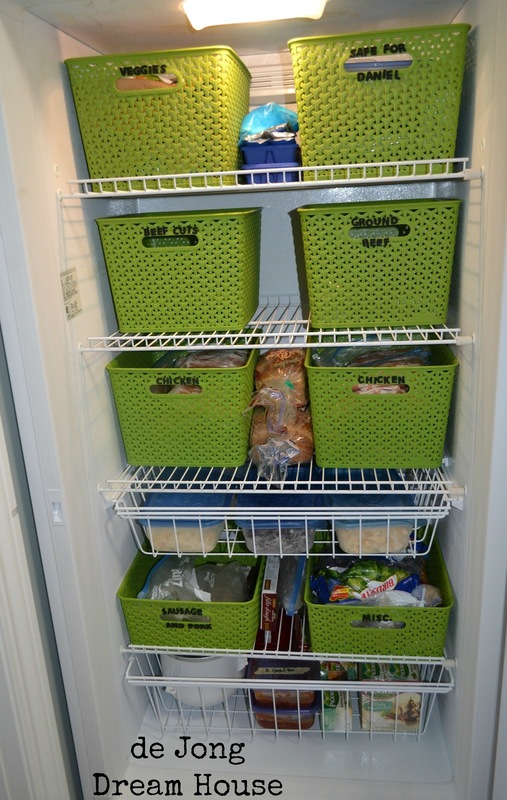 What's your best organizing trick? 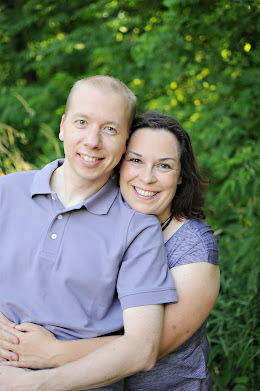 If you like what you've read, we love for you to follow us on Facebook and Pinterest. I love your pantry! We didn't have room for one in this house and I miss it! I love your pantry!!! Thanks for linking up, I'll be featuring it later today. This is amazing! 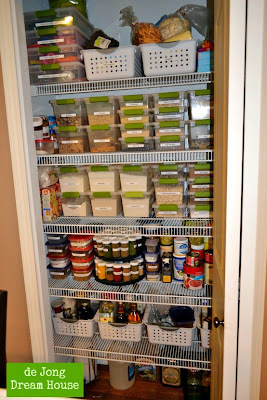 I am having pantry envy over here! I especially love the freezer inventory idea. I found you on the CSI Organization link-up. :) Thanks for the inspiration! It was one of those "why didn't I think of this earlier?" things. Makes my life so much easier! 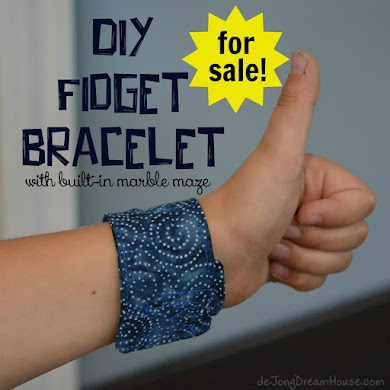 Wow, I just love it, everything about it! I especially love the baskets in the pantry and the writing on the freezer, brilliant! Thanks so much for sharing this at The CSI Project! WOW! Amazing!! What a fantastic job you did! I love the freezer and the contents list on the outside! Brilliant! 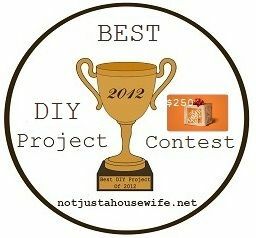 I will be looking around your blog to find ideas I can use in my home! Thanks for stopping by! Putting the inventory on the freezer has saved me SO much time! I love your labels and am drooling over your magnet sheet spice organizer. WOW! Thanks for the invite! On my way! Great pantry! question - are the sterilite containers for the grains/sugars air tight? I haven't had any issue with the grains going rancid or any critters getting in. I do go through my dry goods fairly quickly, though. However, I am in the process of converting to glass containers for food items. I like the Ziploc Versawear for the small containers, but have yet to find something with the wide mouth I prefer for my flours, so those continue to be housed in the Sterilite containers without any issues. I love your spice drawer! We have our spices in the cabinet above the stove. Unfortunately for me being short, I can only reach the first row! And forget about trying to put the glass jars back up there - just a matter of time before one falls & shatters. 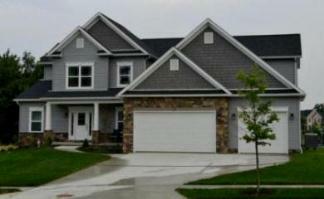 Thanks for sharing so many pics of your house!